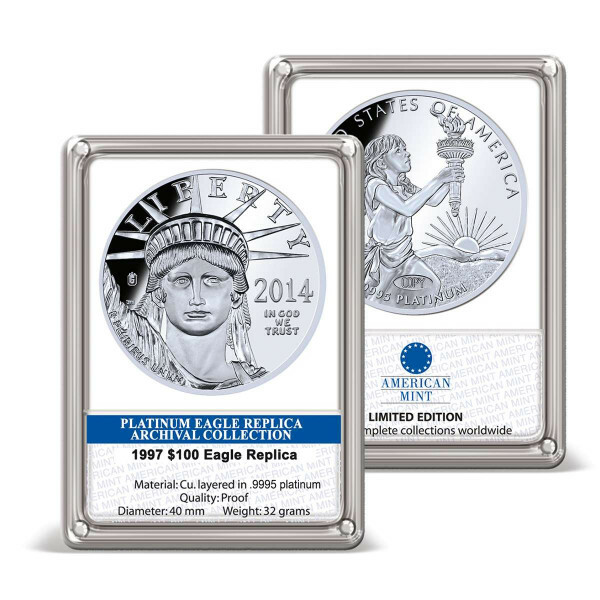 Includes a free preview of future issues in the collection Platinum Eagle Replica Archiv. . For more information, please refer to the Satisfaction Guarantee tab below. If you do not wish to preview future issues in the collection, you may purchase the single item using the 'Individual Item Only' tab at right. In 1997, the U.S. Treasury began minting the American Platinum Eagle, the official platinum bullion coin of the United States. Minted in $10, $25, $50, and $100 denominations, the Platinum Eagle isthe only U.S. bullion coin to have a new reverse design every year, each depicting a unique image honoring America. This beautiful replica of the 2014 $100 Platinum Eagle features a young Lady Liberty carrying a torch as the sun rises over the top of a mountain.